SMEG has been a leading producer of kitchen appliances since 1948. The first cooker was produced by he company in 1956; since then, the modern, clean designs have made it a popular choice throughout the world. A SMEG cooker is designed to be functional and easy to operate. Use your SMEG cooker to produce perfectly cooked meals. Select the burner you want to use by looking at the pictograms on the front panel of the cooker. Each burner position is indicated by a small black circle in its appropriate position on the cooker top. For example, a small black mark on the top right-hand side of the pictogram indicates the burner is the one located at the rear on the right-hand side. Press in the burner control knob toward the cooker and turn it anticlockwise toward the maximum flame setting indicated by the largest flame pictogram. The burner will ignite. Some models have a separate ignition button. If this is the case, turn the burner control to the maximum flame setting and press the ignition button to light it. Adjust the heat by rotating the burner control knob to the right or left until you get the flame you want. Turn off the burner by rotating the control knob to the off or zero position, often indicated by a large black dot. Set the appropriate oven function using the function control knob, which is usually indicated with a pictogram of two heating elements in an oven. Rotate the function control to the left or right to select the desired function. You can select the oven light, which is indicated by a light bulb pictogram; upper, lower or both upper and lower heating elements, or grill function, indicated by a tooth-edged or broken line; or fan-assisted cooking, indicated by a fan pictogram. Set the oven temperature by rotating the thermostat control -- signed by a thermometer pictogram -- clockwise until you select the appropriate temperature. Wait for the heating light to turn off before using the oven. The light illuminates while the oven heats to the desired temperature and illuminates and turns off during the cooking process as the temperature is maintained. Turn off the oven by rotating both the temperature and function controls to the off position, indicated by a vertical black line or large black dot on the control panel. Light the oven burners by pressing in the oven control knob toward the cooker and rotating it to the maximum temperature setting. Hold the knob in position for approximately five seconds for the automatic ignition to light the burner and to preheat. Release the knob. If the burner doesn't light, and repeat this process. Rotate the temperature control until you get the desired cooking temperature. Turn off the oven by rotating the temperature control to the off position, indicated by a vertical black line or large black dot on the control panel. Set the clock to the current time by pressing the time adjustment button or the start and end time buttons together -- indicated by a boiling pan and a crossed pan, respectively -- and simultaneously pressing either the plus or minus buttons to set the current time. Select the cooking function and desired temperature by rotating the appropriate controls, as described in the oven operation details. Set the start time by pressing and holding the start time button, indicated by a boiling pan, and using the plus and minus keys to select the appropriate cooking start time. Set the finish time by pressing and holding the end time button, indicated by a crossed boiling pan, and using the plus and minus keys to select the appropriate cooking start time. Cooking will now start and end at the selected times automatically. Cancel the automatic cooking times by pressing and holding the start and end time buttons for five seconds. Always refer to the instruction manual of the specific cooker for extra information and more detailed instructions. How do I Light the Burners on a Merritt O'Keefe Stove? 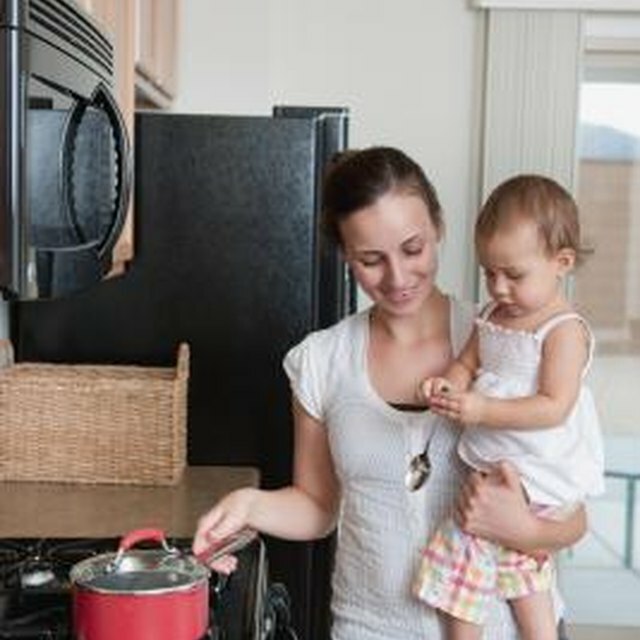 How Much Energy Does a Whirlpool Stove Use Per Hour?